Acid treatments are really effective - no matter if your skin is acne-prone or you just want to work a little bit on your wrinkles, pigmentation or skin condition in general. Not every acid is good for every skin type, I feel like people with sensitive skin types are scared of this type of treatment. One of the mild acids recommended for sensitive skin is By Wishtrend Mandelic Acid 5% Skin Prep Water - a new chemical exfoliator which I want to show you and tell you more about it. I'm 100% sure that when you hear the brand name "By Wishtrend" you're thinking about the online store called "Wishtrend" and you're right. This product was developed by Wishcompany - the owner of Wishtrend, By Wishtrend and Klairs. The bottle of this AHA acid came into a nice box which looks like a rose gold packaging but if you saw other By Wishtrend products then you know that the whole line is all about orange colour so I assume it's an orange colour that looks like something between copper and rose gold - that might be just a brain trick like with black-purple dress, etc. As you can see, you can open this product very easily so keep it away from kids because they can open it. This product is recommended for all skin types - even if your skin is sensitive you can use it but 2 times per week will be enough for you. Water - a source of minerals and moisture. It’s the most basic element of the product. Mandelic Acid - an AHA acid, an antioxidant and chemical exfoliator. This acid works on pigmentation, dull skin, wrinkles and it helps with acne. It kills bacteria very well but it’s also a gentle moisturiser. The lower concentration is delicate while higher concentration is mostly used by specialists. It can be used during the whole year, no matter if it’s winter or summer but still, it’s recommended to use sunscreen during the medication with this acid. If you’re allergic to nuts - mandelic acid is told to be safe to use but still I recommend you talking about using this type of acid with your doctor before using it. Butylene Glycol - a humectant and preservative, it helps other ingredients to get beneath the skin but it’s also a moisturiser. It can be comedogenic. Beta-Glucan - an antioxidant with soothing properties. It’s very effective for sensitive skin and redness. Panthenol - also known as provitamin B5, it’s a humectant and good moisturiser. It helps with sunburns, dehydrated and irritated skin. Glycyrrhiza Glabra (Licorice) Root Extract - it’s an antioxidant and natural ingredient with anti-allergic and anti-inflammatory properties. It helps with wounds healing, redness, inflammation, acne and pigmentation. It works very well on acne-prone and oily skin. Prunus Amygdalus Dulcis (Sweet Almond) Fruit Extract - an emollient full of vitamins such as Vitamin A and vitamin E. It’s a good moisturiser which can work for pigmentation and wrinkles. Sodium Hyaluronate - a humectant, an antioxidant and strong moisturiser that increases lipid barrier and skin elasticity. It can help with wrinkles and pigmentation. It’s a healing ingredient so it can help with post-acne scars, inflammation and speed up the healing process. Sorbitan Sesquioleate - an emulsifier that can be used as a weak moisturiser. Centella Asiatica Extract - also known as Gotu Kola. A source of vitamins A, C and E. It’s an antioxidant with antiseptic and antibacterial properties. It can be used as a treatment for different problems like dark circles under eyes, acne, wrinkles, redness or even as an eczema treatment. It even works on cellulitis, sunburns and it can be used to remove scars that are why it is used in products for acne-prone skin. During the pregnancy, you have to use only small concentrations of this ingredient. Houttuynia Cordata Extract - also called Tsi Extract, an antioxidant with antibacterial and antiseptic properties. It’s used in the product as a skin brightener and moisturiser that helps for various skin care problems such as wrinkles and irritated skin. It can also help with sebum production and acne. Sorbitol - a humectant, that gives the smell to the product. Dimethyl Sulfone - an antioxidant that helps other ingredients get beneath the surface of the skin but in fact, this ingredient also does a lot of good things to our skin, it doesn’t only make skin stronger but it also helps with wrinkles, dark spots and it makes the healing process quicker. Chlorphenesin - a preservative, it shouldn’t be used by kids. Sodium Citrate - a preservative and pH balancer. Arginine - an amino acid and an antioxidant that gives the smell to the product but it has positive meaning for our skin that’s why it is used in many anti-aging products. PEG-60 Hydrogenated Castor Oil - an emulsifier and cleansing agent. It should be avoided during the pregnancy, it’s not the safest ingredient. Ethylhexylglycerin - a humectant and a preservative, it gives moisture to the skin. Hydrolyzed Collagen - a humectant which shouldn’t be used by vegans and vegetarians. It’s a moisturiser that can help with wrinkles. Carbomer - a thickener and stabiliser. It might be comedogenic. It can be irritating for your skin and eyes. It's a liquid acid, it smells for me like an alcohol. I was a little bit scared of how my face is going to react to this product. 5% seems to be a pretty low concentration and I thought that this product won't work on my skin but do you know what? Not always high concentration is the best - sometimes less is better. That's why I've decided to give this product a chance. I do not hide the fact that I've got problems with post-acne scars and pigmentation and the worst thing, in this case, is that removing both is not quick. I'm sure that you all heard some stuff like - do not use acid treatments in the summer. Yes, that's right - if you use acid treatments in the summer, you just make your skin more sensitive to the sun and the sun is not your friend here. I think I was talking about my experience with dermatologists in Poland before - they just told me to sunbathe in the summer and it'll make my acne go away. No, I do not want to die because of the skin cancer and my skin tone is very light, I do not tan - I just burn. Mandelic acid is an acid which you can use whole year straight - even in the summer as long as you use sunscreen because no matter how awesome the acid is we should use it with a sunscreen. It's your choice if you use sunscreen only in the summer or the whole year, I'm not going to talk about that because I feel like everyone have a free will and you will do what you want but if you use acids please use sunscreen because sun damages are pretty hard to fix. Normally, I've been using AHA & BHA acids in an evening routine but with this acid, I'm using it in a morning routine and I leave it for about 15-20 minutes. I'm using this acid 3-4 times per week even if I feel that I can use it every day. It's a very gentle chemical exfoliator - my skin doesn't react with any irritation or redness. I had no allergic reactions to this product even if I wasn't sure if I'll react or not because I've got an allergy to peanuts but almonds are also nuts but on the other side, I'm taking some medicines for my allergy. If you have fresh pimples or wounds then using this product might be a little bit painful but I think it's a delicate product - my skin is not peeling off like with Alpha-H acid when first 3 days of using it were horrible and I had to use sheet masks and different moisturisers to make my skin look fine. This acid brightens my skin and I feel like I look healthier now, I can see some differences with small dark spots - some of are almost gone but I feel like it's too early to say if this product works on dark spots because it's a problem that needs more time - 3-6 months to see any changes. There are some ingredients which I don't like PEG-60 Hydrogenated Castor Oil but more important here for me are extracts and the main ingredient mandelic acid. Overall, I feel very positive about this product even if after second use I felt like nothing's going to change but as you see - time has changed my opinion on this product. If you're allergic to nuts then I recommend you to do the patch test before using this product. This product contains Hydrolyzed Collagen so it's not a vegan-friendly product. You can get this By Wishtrend Mandelic Acid 5% Skin Prep Water from Wishtrend's website (22$/120ml). 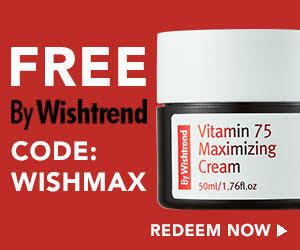 PROMO CODES: This month Wishtrend has some promo codes - use code WISHMAX to get By Wishtrend Vitamin 75 Maximizing Cream almost for free - you only pay for shipping price which in my opinion is a really good deal - I can admit that I also use these codes. 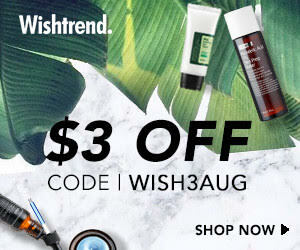 You can also use code WISH3AUG to get -3$ on your order (no minimal price). I think that this product is nice, I won't say it's really good because it's too early for that - I still need to check if it works on dark spots because now it's too early for me to see big differences. It's a product which can start your journey with acids in your skin care because the concentration is pretty low. I hope that you've enjoyed this post. Let me know if you use acids in your skincare and how do you like this product? Kuracje kwasami są bardzo efektywne - bez względu na to czy Twoja cera jest trądzikowa czy po prostu szukasz sposobu na pielęgnacje zmarszczek, przebarwień czy na poprawę stanu cery. Nie każdy kwas nadaje się dla każdego rodzaju cery, mam wrażenie, że osoby z cerą wrażliwą wręcz kwasów się boje. Jeden z łagodniejszy kwasów, które poleca się dla cery wrażliwej to By Wishtrend Mandelic Acid 5% Skin Prep Water nowy peeling chemiczny, który dzisiaj dokładnie Wam przedstawię. Jestem pewna, że kiedy słyszycie nazwę marki „By Wishtrend” to pierwsze o czym myślicie to sklep Wishtrend - tak, macie rację. Produkt ten został stworzony przez Wishcompany - właściciela Wishtrend, By Wishtrend i Klairs. Butelka kwasu AHA dotarła do mnie w ciekawym opakowaniu, które przypomina mi odcień rose gold, jednak jak popatrzymy na inne produkty marki By Wishtrend to widzimy, że cała linia jest sygnowana pomarańczowym kolorem. W tym przypadku co jednak barwa pomiędzy miedzianym a różowym złotem - może to taki trick jak z czarno-fioletową sukienką, kto to wie. Jak możecie zobaczyć, otworzenie tego produktu nie jest problemem, a więc trzymajcie go z dala od dzieci. Produkt rekomendowany jest do każdego rodzaju cery - nawet dla cery wrażliwej, jednak w tym przypadku należy używać produkt dwa razy w tygodniu maksymalnie. Water (woda) - źródło minerałów i nawilżenia. Jest to podstawowy element w produkcie. Mandelic Acid (kwas migdałowy) - kwas AHA, antyoksydant i peeling chemiczny. Kwas ten działa na przebarwienia, cerę poszarzałą, zmarszczki, a nawet na trądzik. Zabija bakterie, ale to również delikatny nawilżacz. W niskich stężeniach jest delikatnym produktem, natomiast wysokie stężenia tego produktu są używane głównie przez specjalistów. Ten kwas można używać przez cały rok, bez względu czy jest to zima czy lato, mimo to rekomendowane jest używanie kremu z filtrem podczas kuracji kwasem. Jeśli macie alergię na orzechy - kwas migdałowy mawia się, że jest bezpieczny dla osób uczulonych na orzechy, jednak mimo wszystko zachęcam do skorzystania z porady alergologa przed zdecydowaniem się na użycie produktu lub kuracji u specjalisty opartej na tym kwasie. Butylene Glycol (glikol butylenowy) - humektant i konserwant, pomaga innym składnikom w przedostaniu się do głębi skóry, jest to dobry nawilżacz. Może być komedogenny. Beta-Glucan (beta-glukan) - antyoksydant z działaniem kojącym Efektywny przy cerze wrażliwej i zaczerwienionej. Panthenol (pantenol) - zwany też prowitaminą B5, to humektant i dobry nawilżacz. Pomaga z poparzeniami, odwodnioną cerą i podrażnieniami. Glycyrrhiza Glabra (Licorice) Root Extract (ekstrakt z korzenia lukrecji gładkiej) - antyoksydant i naturalny składnik z działaniem antyalergicznym i przeciwzapalnym. Pomaga w leczeniu ran, zaczerwienienia, podrażnienia, przy zmianach trądzikowych i przebarwieniach. Dobrze radzi sobie z cerą trądzikową i tłustą. Prunus Amygdalus Dulcis (Sweet Almond) Fruit Extract (ekstrakt ze słodkich migdałów) - emolient pełen witamin takich jak witamina A czy witamina E. To dobry nawilżacz, który może pomóc z problemami takimi jak przebarwienia czy zmarszczki. Sodium Hyaluronate (hialuronian sodu) - humektant, antyoksydant i silny nawilżacz, który poprawia barierę lipidową skóry jak i jej elastyczność. Działa na zmarszczki i problemy z przebarwieniami. Jest to składnik, który działa uzdrawiająco na blizny potrądzikowe oraz stany zapalne - przyśpiesza proces leczenia. Sorbitan Sesquioleate (seskwioleinian sorbitanu) - emulgator, który może być użyty jako słabszy nawilżacz. Centella Asiatica Extract (ekstrakt z wąkroty azjatyckiej) - zwany też Gotu Kola. Źródło witamin A, C i E. Jest to antyoksydant z działaniem antyseptycznym i antybakteryjnym. Może być używany jako środek na wiele problemów takich jak cienie pod oczami, trądzik, zmarszczki, przy cerze naczynkowej i zaczerwienieniu, a nawet jako środek na egzemę. Działa na cellulitis, poparzenia słoneczne oraz pomaga w usuwaniu blizn dlatego też cieszy się popularnością w produktach przeciwtrądzikowych. Podczas ciąży zaleca się używanie wyciągu z wąkroty w małych stężeniach. Houttuynia Cordata Extract (wyciąg z pstrolistki sercowatej) - zwany też Tsi, antyoksydant z właściwościami antybakteryjnymi i antyseptycznymi. Używany w produktach rozjaśniających cerę i nawilżających, które działają na różne problemy skórne takie jak zmarszczki czy podrażnienia. Wyciąg ten sprawdzić może się również przy nadmiernym wydzielaniem sebum oraz przy zmianach trądzikowych. Sorbitol - humektant, który również odpowiada za zapach produktu. Dimethyl Sulfone (dimetylosulfon) - antyoksydant, który pomaga w transporcie innych substancji pod powierzchnię skóry. W rzeczywistości ten składnik ma też pozytywne działanie na skórę sam w sobie - nie tylko sprawia, że cera jest silniejsza, ale działa na zmarszczki, przebarwienia i przyśpiesza proces gojenia. Chlorphenesin (chloropenezyna) - konserwant, nie powinien być używany przez dzieci. Sodium Citrate (cytrynian sodu) - konserwant i regulator pH. Arginine (arginina) - aminokwas i antyoksydant, który nadaje zapachu, ale ma również pozytywne znaczenie dla cery dlatego też używa się go często w produktach przeciwzmarszczkowych. PEG-60 Hydrogenated Castor Oil - emulgator i substancja myjąca. Należy unikać go w czasie ciąży, nie jest to najbezpieczniejsza substancja. Ethylhexylglycerin (etyloheksylogliceryna) - humektant i konserwant, nadaje skórze nawilżenia. Hydrolyzed Collagen (kolagen hydrolizowany) - humektant, który powinien być omijany przez wegan i wegetarian. To nawilżacz, który może pomóc w walce ze zmarszczkami. Carbomer (karbomer) - zagęstnik i stabilizator. Może zapychać oraz podrażniać skórę i oczy. Jest to płynny kwas, który pachnie według mnie jak alkohol. Jak produkt działa na mojej cerze? Bałam się jak moja cera zareaguje na produkt. Stężenie 5% wydaje się być niskim stężeniem i przyznam, że myślałam, że produkt u mnie nie zadziała, ale wiecie co? Nie zawsze wysoka koncentracja jest najlepsza - czasem mniej oznacza więcej. Dlatego też dałam mu szansę. Nie ukrywam, że mam problemy z bliznami potrądzikowymi czy przebarwieniami, co najgorsze jest w tej sytuacji to fakt, że usunięcie obu problemów do łatwych nie należy. Jestem pewna, że słyszeliście już takie teksty jak „nie używaj kwasy w lato”. Prawda, jeżeli decydujesz się na kwasy w lato, musisz liczyć się z tym, że Twoja cera stanie się wrażliwsza na słońce, a słońce nie będzie należeć do Twoich przyjaciół. Wydaje mi się, że wcześniej już wspominałam Wam o moich doświadczeniach z dermatologami w Polsce - poinformowano mnie, że jak chce się pozbyć pryszczy to powinnam opalać się w lato a trądzik ot tak sobie pójdzie won z mojej skóry. Nie, wcale nie marzę o śmierci przez raka skóry, a mój odcień cery , który jest bardzo jasny zamiast się opalać to się na słońcu pali. Kwas migdałowy jest kwasem, który można używać przez cały rok - nawet w lato, tak długo jak sięgamy po krem z filtrem. Bez względu jak wspaniały może być kwas, po krem z filtrem warto sięgnąć dla własnego dobra. Nie będę tutaj prawić kiedy i jak używać kremu z filtrem, bo sądzę, że każdy ma własną wolę i rozum i mówienie, że krem z filtrem dobrze używać wtedy lub wtedy nie ma sensu - i tak zrobicie co chcecie. Jednak pamiętajcie, że jeśli chcecie sięgnąć po kwas to proszę używajcie kremów z filtrem ponieważ zniszczenia na cerze spowodowane przez połączenie kwasu ze słońcem nie są łatwe do usunięcia. Zazwyczaj używam kwasów AHA i BHA wieczorem, jednak w przypadku tego produktu zaczynałam poranną pielęgnację zostawiając kwas na 15-20 minut Używam produktu 3-4 razy w tygodniu nawet jeśli mogłabym śmiało sięgać po ten produkt codziennie. To bardzo łagodny peeling chemiczny - moja cera nie reaguje na ten produkt podrażnieniem czy zaczerwienieniem. Nie miałam również reakcji alergicznych czego pewna nie byłam, bo jest uczulona na orzechy ziemne, ale migdały to też orzechy, ale z drugiej strony jestem na lekach więc wiedziałam, że reakcji może nie być. Jeżeli macie świeże zmiany skórne czy rany to użycie produktu może być bolesne, mimo to sądzę, że produkt jest delikatny - moja skóra nie schodzi płatami jak przy Alpha-H gdzie przez pierwsze 3 dni miałam koszmar i musiałam używać masek w płachcie i różnych nawilżaczy, aby moja skóra wyglądała dobrze. Ten kwas rozjaśnił moją cerę i mam wrażenie, że cera wygląda teraz zdrowiej, wydaje mi się, że widzę jakieś niewielkie zmiany z przebarwieniami - niektóre prawie całkiem zniknęły, jednak jest zbyt wcześnie aby dać werdykt, ponieważ po jakiś 3-6 miesiącach będzie widać czy są zmiany czy nie. Mamy tutaj składniki takie jak PEG-60 Hydrogenated Castor Oil, których nie lubię, jednak co ważniejsze jest dla mnie w tym produkcie to ekstrakty i główny składnik - kwas migdałowy. Streszczając, mam pozytywne odczucia wobec tego produktu, nawet jeśli po drugim użyciu myślałam, że produkt nie pomoże, to jak możecie zauważyć w powyższej recenzji - moja opinia po dłuższym czasie się zmieniła. Jeśli macie uczulenie na orzechy to sugeruję wykonanie testu przed użyciem produktu. Produkt ten zawiera kolagen hydrolizowany, a więc nie jest to produkt odpowiedni dla wegan. Kwas By Wishtrend Mandelic Acid 5% Skin Prep Water możecie kupić na stronie Wishtrend (22$/120ml). KODY PROMOCYJNE: Obecne Wishtrend ma dla Was kody promocyjne - użyj kody WISHMAX, aby otrzymać By Wishtrend Vitamin 75 Maximizing Cream prawie za darmo - płacimy jedynie za cenę wysyłki co według mnie jest ciekawą ofertą, na którą sama się skusiłam. Natomiast z kodem WISH3AUG otrzymacie -3$ na zamówienie bez minimalnej ceny. Myślę, że to całkiem przyjemny produkt, nie powiem, że jest bardzo dobry, ponieważ jest na to za wcześnie - najpierw przetestuje go dokładnie na przebarwieniach, ponieważ w chwili obecnej nie mogę zobaczyć dokładnie jak kwas się zachowuje. Produkt ten jest idealny jeśli chcecie zacząć przygodę z kwasami ze względu na niskie stężenie. Mam nadzieje, że post przypadł Wam do gustu. Dajcie mi znać czy używacie kwasów w swojej codziennej pielęgnacji oraz jak podoba się Wam ten produkt. Ranki można posmarować wazeliną :) A dermatolog, który na trądzik poleca słońce nie powinien się nazywać dermatologiem - opalanie wysusza skórę, trądzik znika w pewnym stopniu, ale potem jest znowu to samo. I also tested this product once. and I thought the same. it is okay but for me it's not recommendable. Really good products! Love it so much!